Do not store lighter close to source of heat or fire such as stove, radiator, fireplace, or direct sunlight, etc. Do not refill lighter in small closed space, in the car, small cabins etc. Always keep away from reach of children. Playing with fire and light is amusing to children which may cause unforgivable results. For safety, please follow these instructions. Do not refill lighter immediately after use. Allow time for lighter to cool off. Set flame height adjuster to minimum. Using a small screwdriver turn the adjusting screw clockwise to tighten the gas valve (some models have adjustable wheel). Hold lighter away from face and clothing. With a screw driver push in the refilling valve to let out the air from inside the fuel tank. Air in the fuel tank will prevent butane gas from being injected and causes the lighter to malfunction. 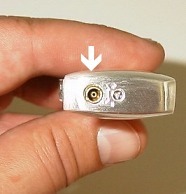 Always refill lighter in an upside down position, as shown in the picture. 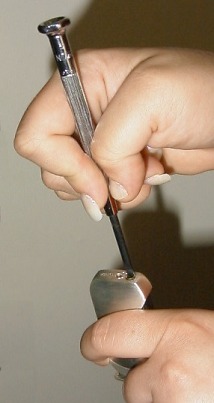 Shake the butane refill gas can, press the stem of the refill can into the refill valve of the lighter. Fill gas into the lighter for 5 seconds. You may repeat, for shorter period of time. Allow 3-4 minutes for gas and lighter components to reach room temperature. Turn the flame adjuster slowly counter clockwise to reach the desired flame height. Use only well known brand name gas refill cans with a minimum of triple-refined quality. Impurity of the gas will cause congestion and malfunctions. We strongly recommend the Vector Quintuple Refined fuel.